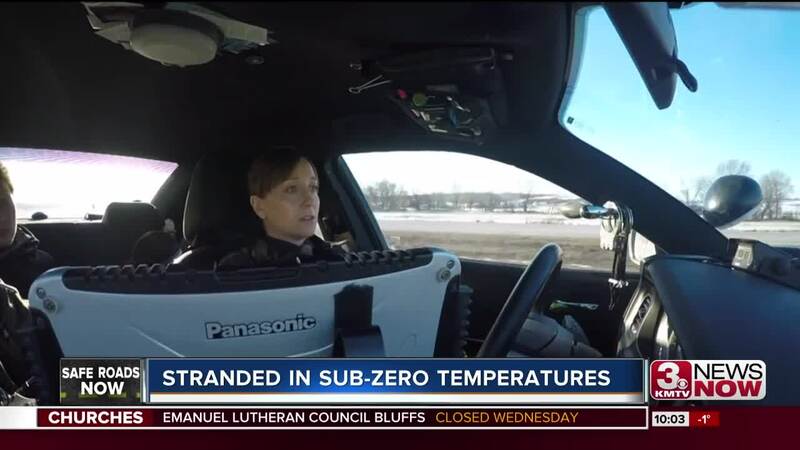 COUNCIL BLUFFS, Iowa (KMTV) — Iowa State Patrol troopers have been hard at work rescuing stranded drivers in the dangerous cold. Drivers were advised to stay off the roads and stay inside Tuesday. We road along with Iowa State trooper Rose Ives who was ready to help anyone stuck on the side of the road. "I think that happens frequently. Frequently enough that we just expect it to happen," Ives said. Ives has been keeping an eye on I-80 traffic for about two years. She says her job with the state patrol is different than her last job as a city cop in Red Oak, Iowa. "It is different working this job in the wintertime much different than it was in the city. The city we dealt with snow emergencies and making sure the roads were clear, so that they could be plowed, etc. In here, you're trying to get to people when they get into wrecks and keep an eye on the roadway," she said. Other troopers had their hands full. When a semi got stuck on the shoulder, Trooper Raes helped the driver escape the freezing temperatures. Trooper Dan Loussaert also helped a man after his truck went into the median. He shared a picture that showed when another driver lost control and slammed into the man's truck. Loussaert tweeted "We got lucky." Fortunately, Ives didn't have to step out and endure the frigid winds when we rode with her. However, she did have to help change a tire Monday night on the side of the highway, which wasn't ideal. "It's not safe to pull over on the side of the interstate just because of excessive speeds of other travelers and running the risk someone isn't paying attention when you're on the side of the road, so move off the roadway. But, obviously that's not an option if you're having car problems or something like that," she said.